This will be the final day to visit the beautiful Gainsborough's Family Album exhibition! Featuring over fifty works from public and private collections across the world, Gainsborough's Family Album will provide a unique insight into the private life and motivations of Thomas Gainsborough ( Protected content ), one of Britain's greatest artists. 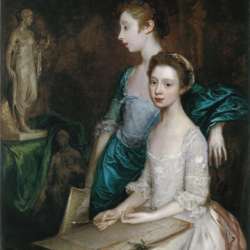 The exhibition includes a number of works that have never been on public display in the UK and will bring together for the first time all twelve surviving portraits of Thomas Gainsborough's daughters. Gainsborough's Family Album charts Gainsborough's career from youth to maturity, telling the story of an eighteenth-century provincial artist's rise to metropolitan fame and fortune.